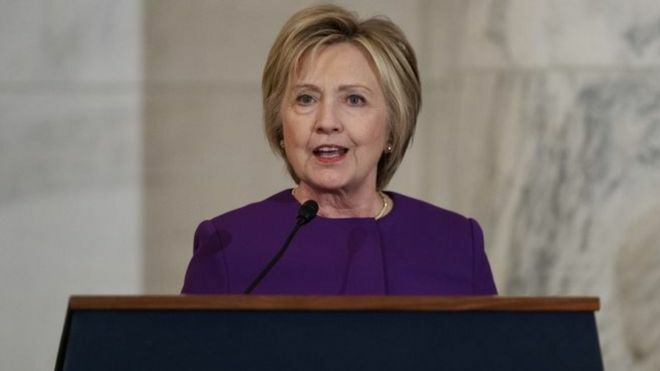 Losing US Democratic presidential candidate Hillary Clinton has called for urgent action to stop the proliferation of “fake news”. Mrs Clinton said it was an epidemic with “real world consequences” that threatened America’s democracy. She urged the private and public sector to combat the numerous false reports, propaganda and malicious stories that had been spread over the past year. She herself has been the target of fake news, including the “pizzagate” story. It wrongly stated during the election campaign that a paedophilia ring involving people at the highest levels of the Democratic Party was operating out of a Washington pizza restaurant. Last Sunday, a man was arrested after firing a rifle inside the restaurant. The attacker later said he wanted to “self-investigate” the news reports. No-one was injured in the incident. “It’s now clear that so-called ‘fake news’ can have real world consequences,” Mrs Clinton told lawmakers on Capitol Hill on Thursday. “This isn’t about politics or partisanship. Lives are at risk. Lives of ordinary people just trying to go about their days, to do their jobs, contribute to their communities. “It’s imperative that leaders from the private sector and the public sector step up to protect our democracy and innocent lives,” she added. She was speaking at a ceremony for outgoing Democratic Senate Minority Leader Harry Reid – one month after losing the presidential elections to Republican Donald Trump. “This is not exactly the speech at the Capitol I hoped to be making after the election,” Mrs Clinton joked.